Review: 1984, Almeida Theatre ✭✭✭✭✭ | Fourthwall Magazine & The Drama Student – The magazine for careers in the performing arts – actors, drama students, directors, producers, writers, production crew. 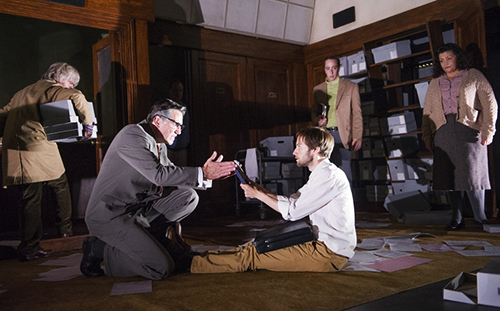 Currently sold out at The Almeida Theatre is the remarkable stage adaptation of George Orwell’s groundbreaking 1984. Faced with the task of creating something new and original from a novel so imprinted in the minds of its readers, Robert Icke and Duncan Macmillian begin at the end, embracing the novel’s appendix and gaining fresh inspiration. The result: a spine-tingling five star piece of theatre. This fresh vision of 1984 feels like a rediscovery of Orwell’s dystopia. Over 60 years after it was first published, we are reminded of how chillingly relevant it still is, perhaps more so than before, twenty years further into the future Orwell imagined. Icke and Macmillian, careful and yet inventive, capture the essence of the novel and succeed in transforming it into resonating dialogue and ingenious staging. The stunning design by Chloe Lamford transforms a stoic, drab study into the blindingly stark Ministry of Love. The use of powerful visuals and sound effects are an exhilarating assault on the senses. Screens bring another stimulating dimension to the stage and the superb cast adapt from stage to screen acting effortlessly. Mark Arends is a sensitive, mild-mannered Winston. Immediately likeable, he urges the audience to invest in his plight against Big Brother and champion his search for the truth. The love he feels for Julia stands out as a thing of hope and beauty in such a hopeless situation, making it the prospect discovery all the more emotive and utterly terrifying. Their world of screens and surveillance rings alarmingly true to modern life. This inspiring version of 1984 allows us to see Orwell’s depiction in all in a whole new light, posing questions about the way we live now and what the future holds for us still. As the play goes on, harrowing scenes of interrogation and torture become almost too uncomfortable to watch, perhaps because it holds too clear a mirror to reality as we know it. Compelling, powerful and innovative, 1984 is a must-see production which will leave you feeling sobered and awestruck by its bold brilliance. Enough said.